Microsoft Excel is surely a savior for CAs as it makes their job a lot easier. With so many Excel formulas for accounting and finance professionals, they can manage their workload with ease. Therefore, in order to make sure that CAs master the Excel skills, we have come up with some fantastic Excel tricks for Chartered Accountants that not only make their job quicker but also makes it smarter. Based on the inputs from some finest Excel experts, we have compiled few Excel tips for Chartered Accountants that are a big help to them. For easier data entry and lesser errors, having a spreadsheet that many people can use is one of the Excel tricks for CA. Users can make selection from drop down list of the different data options given in the cell. You can create your own drop down list by first creating your list of data options in one column or row. To keep working simpler, you can give a particular name to the complicated formulas you and your team members will need to use. This will help everyone understand it and use it effectively instead of typing it again and again. This is surely a smart advanced Excel trick for chartered accountants, especially in situations when many people are working on the same spreadsheets. Just on one click, you can summarize huge data using Pivot Tables. They are truly a wonderful Microsoft Excel trick for Chartered Accountants as it is not only easy but makes data analysis simplified. The only thing you need to keep in mind that your data is in an organized format. Yet another essential tool for CAs as they can use conditional formatting for cells that have some specific text or value in it. You can easily highlight particular cells with some specific information which brings out a clear picture of the data on just one click. All you need to do is click on Conditional Formatting which is under Home tab. It is the amazing feature of Excel called relative reference in which the cell reference automatically changes when it is copied to some other cell. With this feature, you don’t have to worry as the results are updated in reference with the position of the cell. But in situations when you don’t want the cell reference to change then you can use absolute reference so that the reference stays the same even if the contents of a particular cell are copied and pasted somewhere else. This can be done by simply adding a dollar sign to the cell reference. With COUNTIF you can easily count how many times a particular data appeared in your spreadsheet. By using this function, you can know that number of cells which meet some particular criteria in your data. It can be a particular word or figure. You can speed up the navigation process if you are working on a huge spreadsheet just by holding the CTRL key along with arrows. Likewise, if you wish to select lot of data at the same time then you need to hold Shift along with CTRL and the arrow. This will make the process a lot faster. When the size of the spreadsheet is large or there are too many sheets involved in your working then by using Watch Window, you can comfortable keep some of your data all the time visible so that you can refer to it anytime you want without wasting any time or navigating back to a particular point. All you need to do it go to the Formula tab and select Watch Window. By using F4 key, you can copy the formatting from one cell to another. All you need to do is apply formatting and click on the cell where you wish to copy the formatting and simply press F4. This is a shortcut key which is another important Excel trick for Chartered Accountants. Alt + O C A / ALT +HOI: To auto-fit the content by altering the width of cell. Alt + HMC: To merge adjacent cells. Alt +HW: To wrap the contents of the cell when you don’t want to alter the width of the cell. Ctrl VP/VN: VP for page break view and VN for normal view. 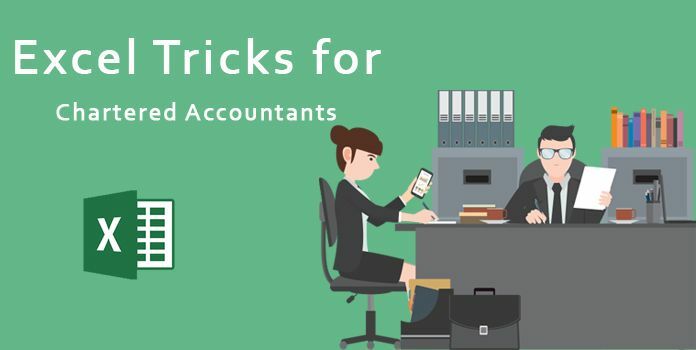 Make sure that you use these amazing Excel tricks for Chartered Accountants which can be of great help in your day-to-day life for hassle-free working. Click here to download Excel Formula, Tips, Shortcuts, Tricks for Chartered Accountants file in PDF.